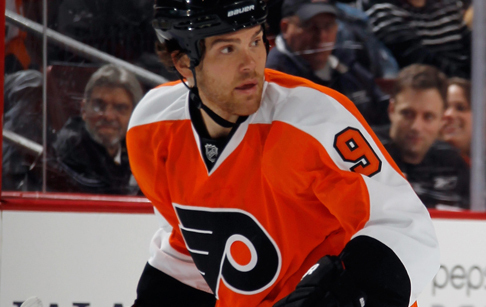 VOORHEES, N.J. – Claude Giroux hasn’t scored a goal in 20 games, dating back to last season. He’s also the guy who lost coverage on Jordan Staal with 52 seconds to play in Tuesday’s game, costing the Flyers at doing something that had never been done before in franchise history – have consecutive shutouts on the road. Giroux’s lack of production can also be equated to the Flyers scoring more than two goals in a game just once in 14 contests this season, to the team being the worst scoring team in the NHL through the first month-plus, and to the Flyers having a bottom tier power play. It’s not all Giroux’s fault mind you, but he does bear the brunt of the load on his shoulders as the team’s best player and captain. And yet, despite all the negative numbers. Despite the terrible start. Despite the fragile confidence of the team, Giroux still remains steadfast that the team will figure it out and turn it around. He’s more elaborate now with the assessment of what is wrong with the team, but at the same time he remains the fearless leader. He remains upbeat despite all his obstacles. He remains focused on figuring out what ails the team, even if he is sometimes part of that problem. Every time he's asked about his own drought or the team's struggles, Claue Giroux remains upbeat and promises a turnaround. Plenty of points. Plenty of goals. Plenty of confident players who don’t dread a one-goal deficit, or who don’t dwell on struggling to get past two scores in a game. 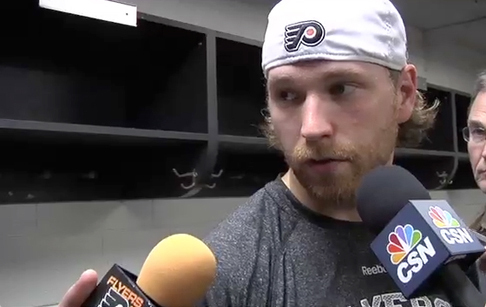 And that’s where Giroux is being more philosophical about his team. He claims confidence as a group, but notices chinks in the armor at the same time that are causing the lapses in judgment, faith and productivity. He pointed out, after five games, that the Flyers were still close enough to catch up and now, after 14 games, it’s no different. It’s the kind of thing that teams like to hear from their captain, although this team would like to see him finally score as well. But, he’s not alone in his assessment. Lecavalier should know. He won a Stanley Cup with the Tampa Bay Lightning in 2004, a team that was plodding along until it got white hot at midseason and never looked back. “Every season there are ups and downs and when you are down you have to get out of it as quickly as possible,” he said. “Individually, when you have slumps you want to get out of them quickly. Right now we can’t look at our record. We need to focus one game at a time on what we know we can do. We like our team – we always say that, but we do – we just have to know that we’re only six points out of the playoffs, so once we get that confidence then you start rolling. Like win the Stanley Cup, despite a bad start. Of course, that’s not on the Flyers radar at the moment. Nor is playoff talk. Nor is standings or rankings or goal totals or differentials. “Hard work and doing thing’s right, we’ll get out of it,” coach Craig Berube said. “Simplify… You think [the lack of confidence] changes when you play a game like we did in New Jersey… but then it slips… at some point they, as a team, need to come out, believe, and go play 60 minutes. They can do it. They’ve done it a few times here and we’ve gotten some wins, but certainly we haven’t done it enough. And the way things have gone so far, almost every game is low scoring, tight-checking and a see-saw for much of the contest – not that it’s a way they want to play, but they will if they have to. “It’s not our mindset, but it’s our reality right now,” Berube said. “Until the puck starts going in the net, then you do have to win 2-1 or 1-0. That’s the way it goes. There’s going to be a lot of games that are tight like that. You just have to win them. Good teams win them. Steve Downie is skating on his own and is listed as day-to-day as he recovers from his concussion. NOTES: The Flyers sent Tye McGInn back to the Adirondack Phantoms and recalled Kris Newbury… Steve Downie skated on his own Wednesday. He’ll skate on his own again Thursday. For now, he’s listed as day-to-day with a concussion…. Berube mixed up the lines again at practice. He had Scott Hartnell with Giroux and Jake Voracek (together again); Brayden Schenn on the left wing with Lecavalier at center and Matt Read on the right; Michael Raffl with Sean Couturier and Wayne Simmonds and Zac Rinaldo with Adam Hall and Jay Rosehill… Defensive pairs stayed the same, meaning it’s likely Luke Schenn and Erik Gustafsson will be healthy scratches for a third consecutive game Thursday.